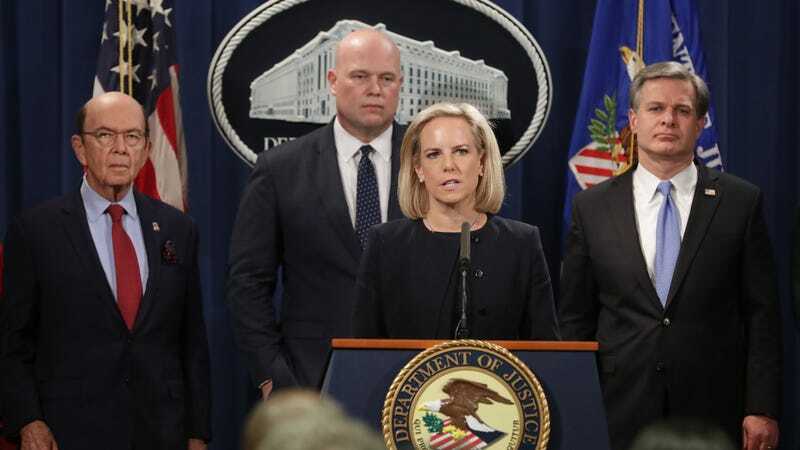 U.S. Commerce Secretary Wilbur Ross, acting Attorney General Matthew Whitaker, Homeland Security Secretary Kirstjen Nielsen and Federal Bureau of Investigation Director Christopher Wray announce new criminal charges against Chinese telecommunications giant Huawei at the Department of Justice January 28, 2019 in Washington, DC. The U.S. Justice Department on Monday announced two indictments against the Chinese telecommunications firm Huawei, which it said is accused of theft of trade secrets, obstructing justice, and lying to banks over its alleged non-compliance with U.S. sanctions against Iran. Whitaker said Huawei engineers had violated confidentiality agreements by “secretly taking photos of the robot, measuring it, and even stealing a piece of it.” The robot, nicknamed “Tappy,” is used to perform durability tests on phones sold by T-Mobile, according to an earlier report by the Wall Street Journal. Specifically, Huawei and Skycom are charged with bank fraud and conspiracy to commit bank fraud, wire fraud and conspiracy to commit wire fraud, violations of the International Emergency Economic Powers Act (IEEPA) and conspiracy to violate IEEPA, and conspiracy to commit money laundering, according to the DOJ. Further, as part of an investigation in the Eastern District of New York, Huawei and its U.S. subsidiary are charged with conspiracy to obstruct justice. Whitaker said the U.S. is currently seeking an extradition order in Canada for Meng, who has said she is innocent of charges, which include bank fraud, wire fraud, and conspiracy to commit both. Huawei is also accused of lying to the U.S. government and obstructing justice, he said, including by concealing and destroying evidence and moving potential witnesses back to China and therefore out of the reach of U.S. prosecutors. Huawei did not immediately respond to Gizmodo’s request for comment on the charges and related allegations.